There are 55,000+ courses on Udemy, 2,000+ on Coursera and 6,200+ on Lynda. To make things different, we decided to create a roundup of “standalone” courses that weren’t published on any major course marketplace. We started with a spreadsheet of 30 under‐the‐radar courses and reached out to every course instructor, asking for temporary access to their course, so we could get a comprehensive overview of each one. There are a few things we considered when reviewing each course. Who is the instructor, and what have they achieved? Is this for beginner, intermediate and/or advanced students? Is it up‐to‐date with relevant information? What is the structure like? Is it easy to follow? What’s the course’s overall quality? What type of content does it include? With that being said, let’s talk courses. 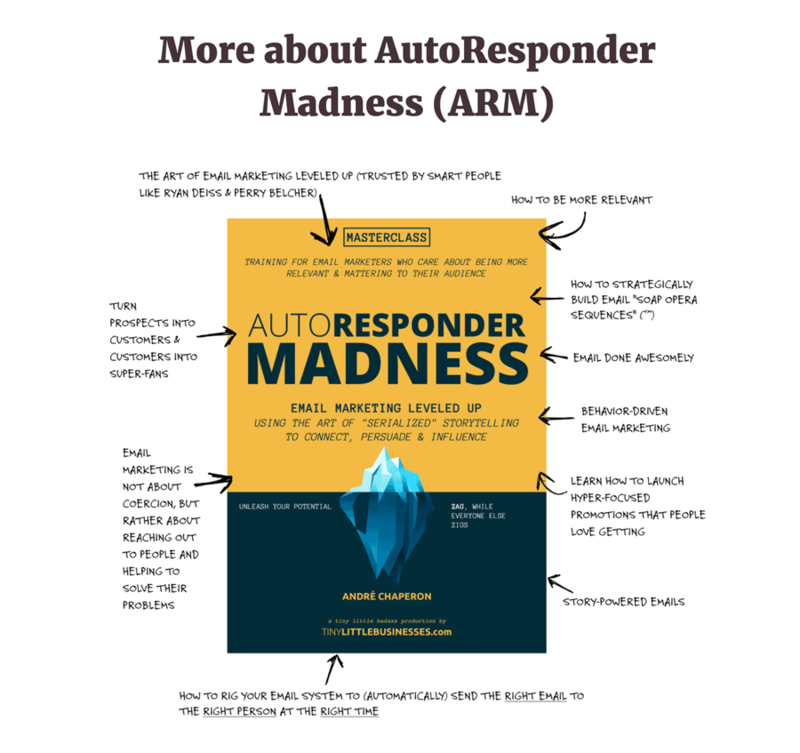 I discovered this course a few years ago, when a prominent client (who has taken all the best marketing courses under the sun) highly recommended AutoResponder Madness by Andre Chaperon. If you think Ramit Sethi writes damn good email series, you’ve never read Andre Chaperon’s. And they’re keeping him a secret for good reason… his content is just too good to share, so much so, it makes you want to be selfish with it. All I’m saying is: If everyone could write email sequences like this man, a lot more of us would be rich. ARM provides students with a simple, evergreen email strategy “that’ll make every name on your email list worth 200 percent more than it is now (at a minimum),” Chaperon boasts, on his text‐heavy landing page, which I bet you’ll read every single word of. 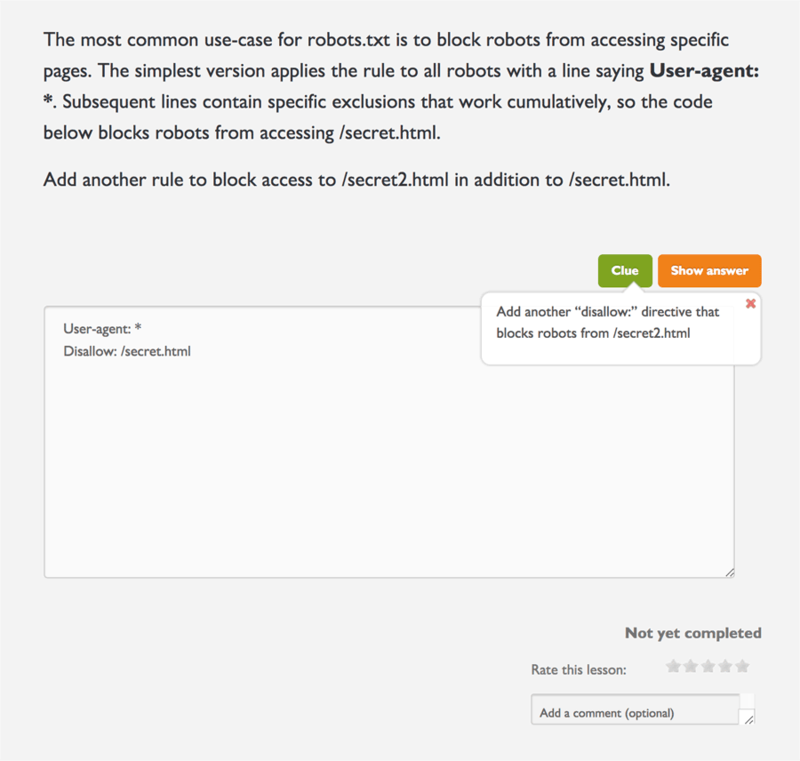 Not only will ARM students learn techniques like this and more, but they’ll also learn how to automate it all as well. There are no videos that waste your time with silly introductions and there are no fancy slides. It’s all tactical, meaty text all the time. If you purchase ARM for $397, you’ll be directed to the self‐paced course dashboard, where, to move onto the next part of the system, you have to mark the prior lesson complete. Chaperon designed it this way because the best way to master his framework is to learn one piece of the system at a time. 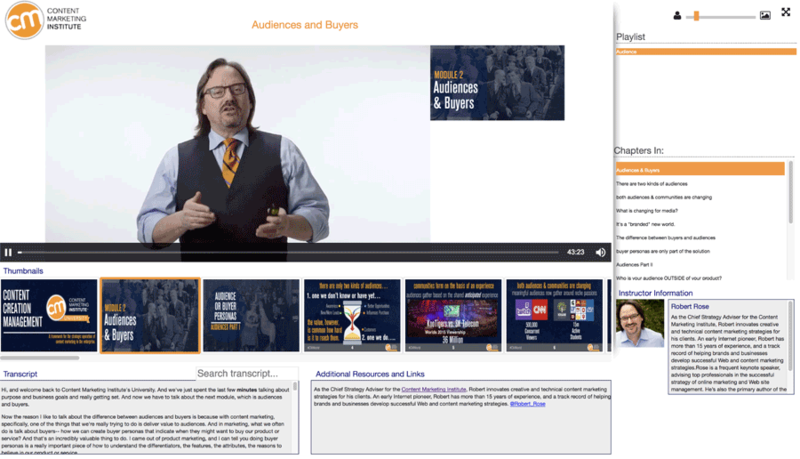 Brian Dean is the founder of one of most well‐known (and respected) blogs about SEO — Backlinko. He started his professional journey as a freelance writer and SEO consultant. Today, Brian is an internationally recognized SEO expert, an SEO rockstar for many. 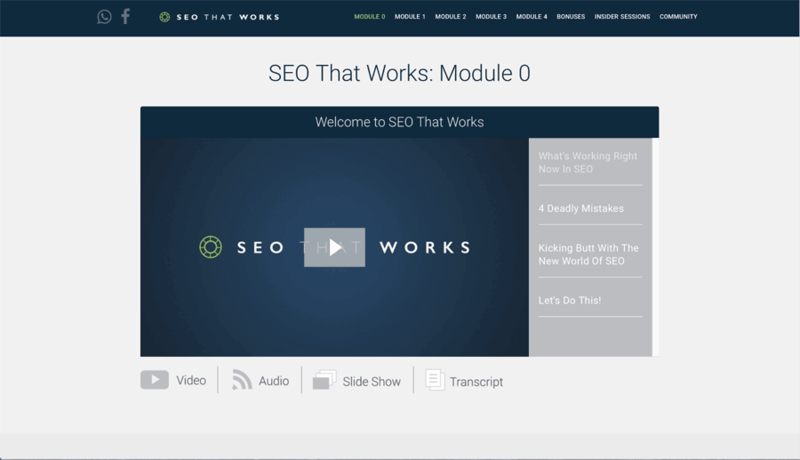 His course, SEO That Works, will teach you how to get more organic traffic to your website even if you have never heard of search engine optimization before. Each lesson features a high‐quality video, downloadable transcript, slideshow and worksheets, which you can revisit as needed. Dean recommends watching the lessons in order because he set it up like a system, where each module builds on the next one. Here I reviewed SEO That Works 2.0, SEO That Works 3.0 releases in February 2018. The new version will have an even better‐looking UI than 2.0 and new (and updated) content. Fun fact: Dunn was one of Drip’s very first customers. It’s broken up into three sections: Basic, Advanced and Mastery — all of which build on each other. Each section includes 20–30-minute videos accompanies with some text/notes. The basic section includes a lot of theory. 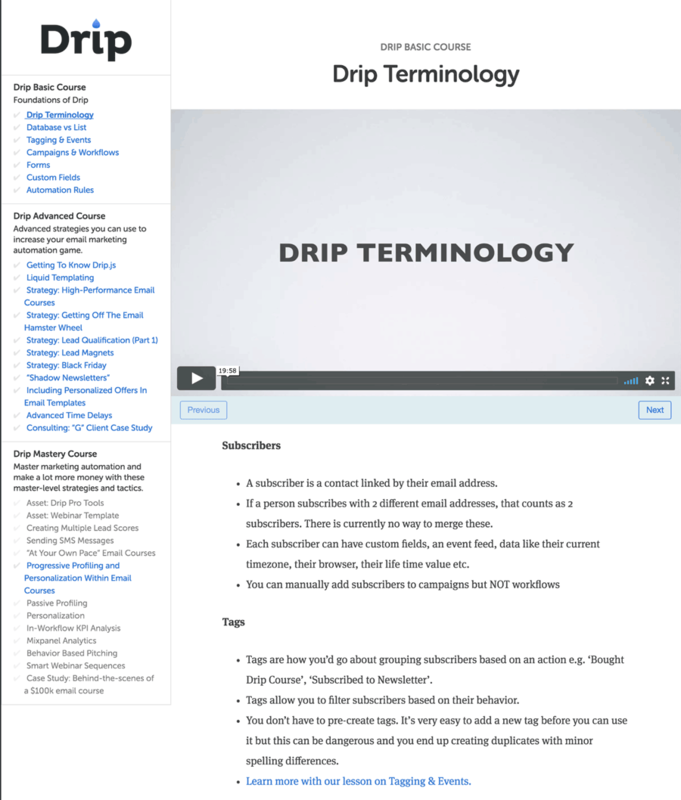 It explains the terminology Drip uses and lays a foundation for the rest of the course. 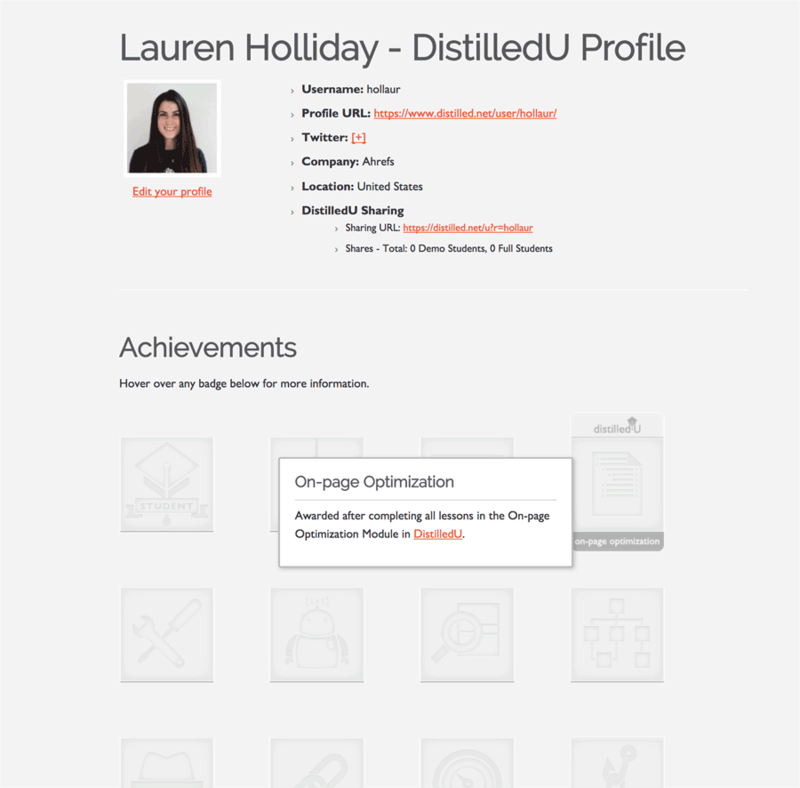 The advanced section features personalization strategies and provides a few email templates. Webinar Template: This template makes setting up webinars a breeze. It just requires you to swap out a few bits of copy, change the date and time, and point it to the right Drip form. Will Critchlow is the founder and CEO of Distilled, the world‐renowned 40‐person, marketing and SEO agency, which has worked with big brands, including eBay, Red Bull and Grovo. 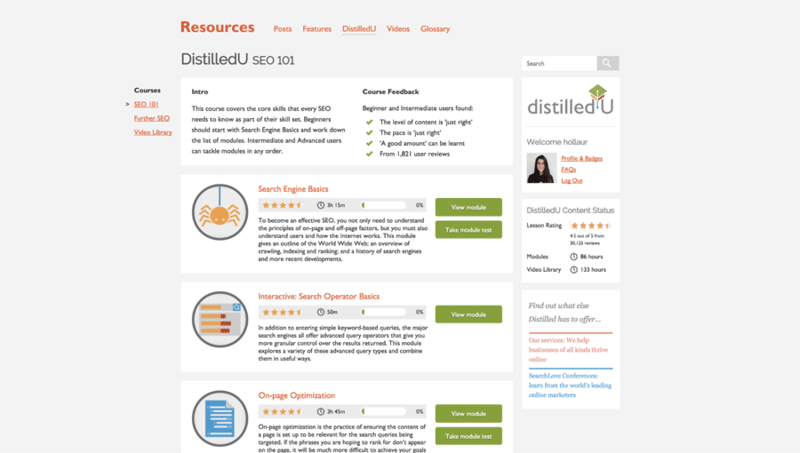 In addition to running Distilled, Critchlow hosts the popular SearchLove conference series in San Diego, Boston and London (2018), runs the SEO split‐testing platform DistilledODN and produces most of the content for DistilledU. 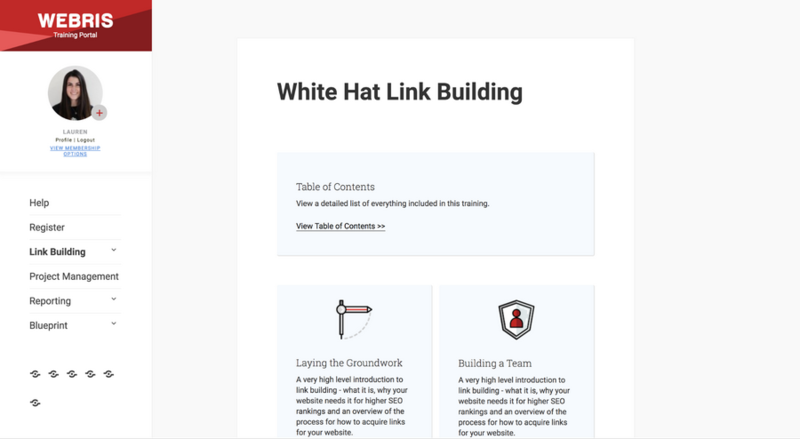 Further SEO: This course covers advanced topics, including outreach, linkbait, content strategy, video and SEO tools, taking your SEO skills to the next level. Video Library: The video library contains 133 hours of HD videos from SearchLove, in no particular order. For example, it’s nice to know how long a lesson or module will take you to complete, and you can easily provide feedback on each lesson. The quizzes are different too. They’re more like interactive exercises (see screenshot below). These badges will appear on your profile as you successfully complete the course modules. Unlike the other courses in this post, DistilledU is subscription‐based. It costs between $33-$40 per month, depending on whether you purchase a monthly or annual subscription. More than 3,000 students have enrolled to learn how to drive more traffic from search engines, like Google, Amazon, Pinterest and YouTube. Introduction: Set up the perfect SEO environment and understand the sales funnel. 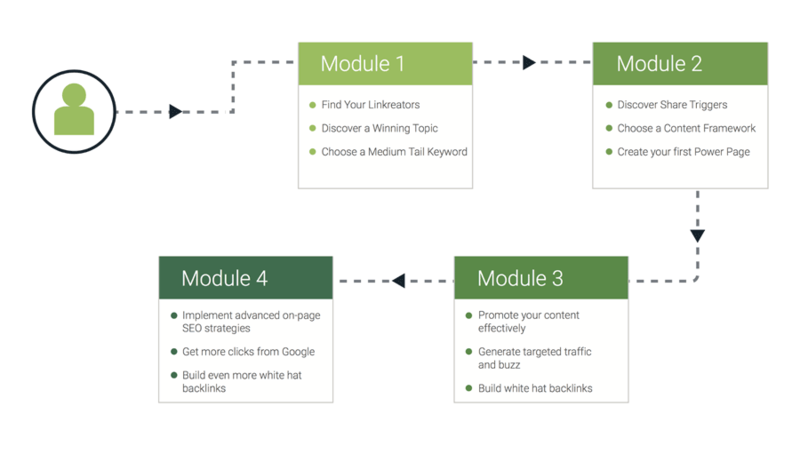 Introduction to Organic Search: Learn SEO fundamentals before diving in. 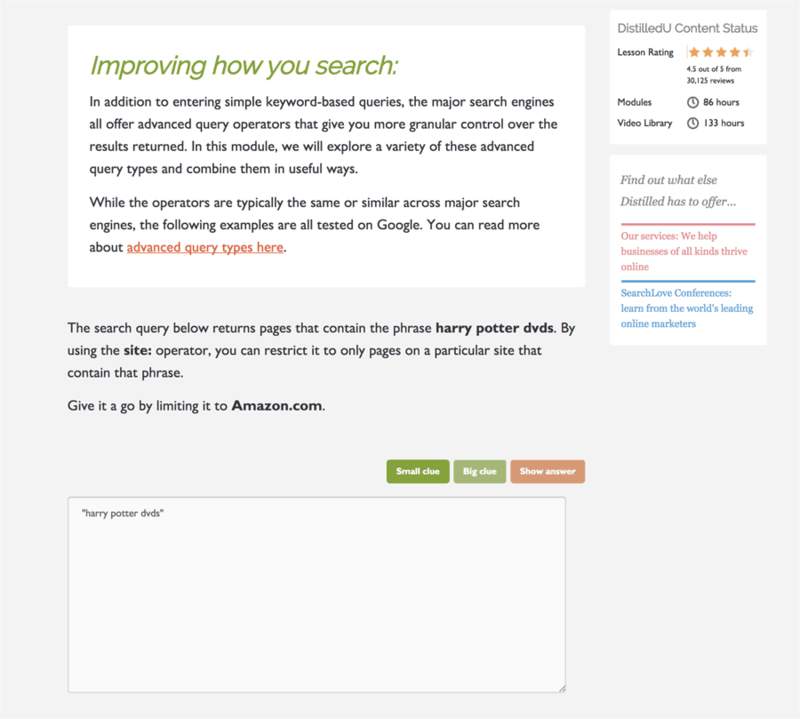 Keyword Research: Learn about keyword research and why it’s so important. Document Relevancy: Learn how to optimize for search engines. Technical Optimization: Learn the technical aspects of SEO. Link Building & Authority: Understanding “popularity” metrics on various platforms. Start a New Site From Scratch: Learn from start‐to‐finish how to build a new site from scratch in the most search engine friendly way possible. 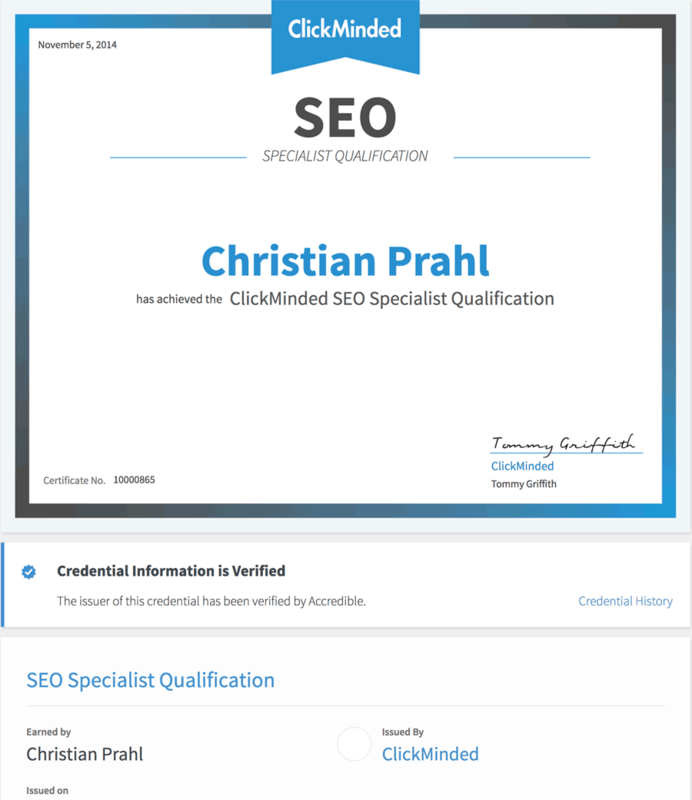 The ClickMinded SEO Certification: Once you’ve completed the course, earn your certification by getting an 80 percent or higher on the exam. There is absolutely so much great content — videos, slides, resources/links, worksheets and quizzes — packed into this $497 course. 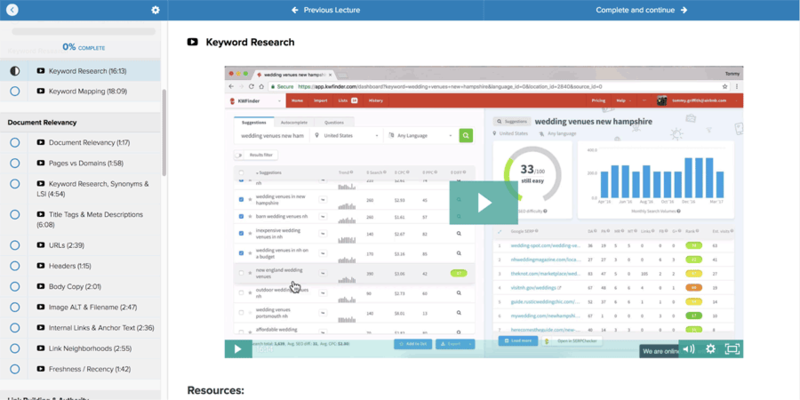 The writer of that case study — How We Ranked #1 for a High‐Volume Keyword in Under 3 Months — is also the creator of the next course I’m about to share with you. His name is Dmitry Dragilev, and he’s the founder of JustReachOut, a DIY PR tool, and the well‐known marketing and PR blog, Criminally Prolific. Dragilev has published more than 1,400 articles in the last nine years, and he’s used unconventional PR tactics to grow a startup (acquired by Google) from nothing to more than 40 million pageviews. Influencers like Sumo’s Noah Kagan, Ahrefs’ very own Tim Soulo and Backlinko’s Brian Dean have all sung Dragilev’s praises. 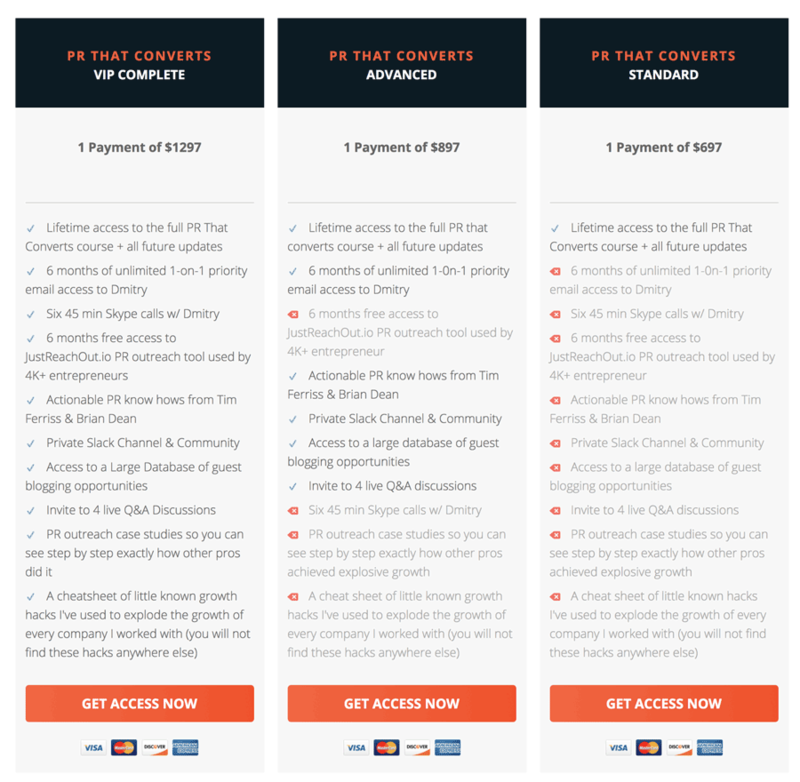 PR That Converts includes four modules, comprised of four to six lessons each. Lesson content includes videos, slides, quizzes, homework and a commenting section, where students can ask questions. Dragilev designed the course sequentially so you have to complete each lesson before you can move onto the next. Ryan Stewart is the founder of WEBRIS, a digital marketing agency he launched in 2016. He’s built it from the ground‐up, getting to 1.2 million organic pageviews and making six‐figures in its first year. Before forming WEBRIS, he helped big brands, including Accenture, Target and Best Buy, increase revenue. Stewart even teaches you how to outsource all this work and hire the right people as well. The course ranges from $849 to $1,949 and allows you to train your entire team, if you wish. Before there was Buffer, there was Hootsuite. Founded in 2008, today, Hootsuite boasts 30,000 customers, 270,000 users and more than 8.1 million Twitter followers, making it No. 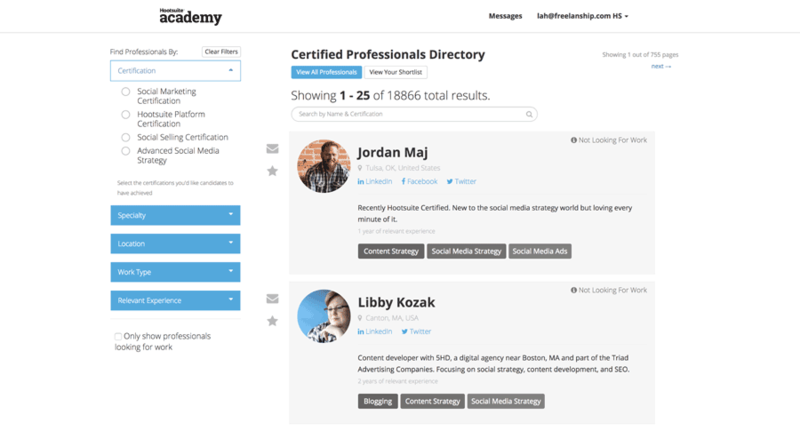 2 on Capterra’s list of the best social media management software. 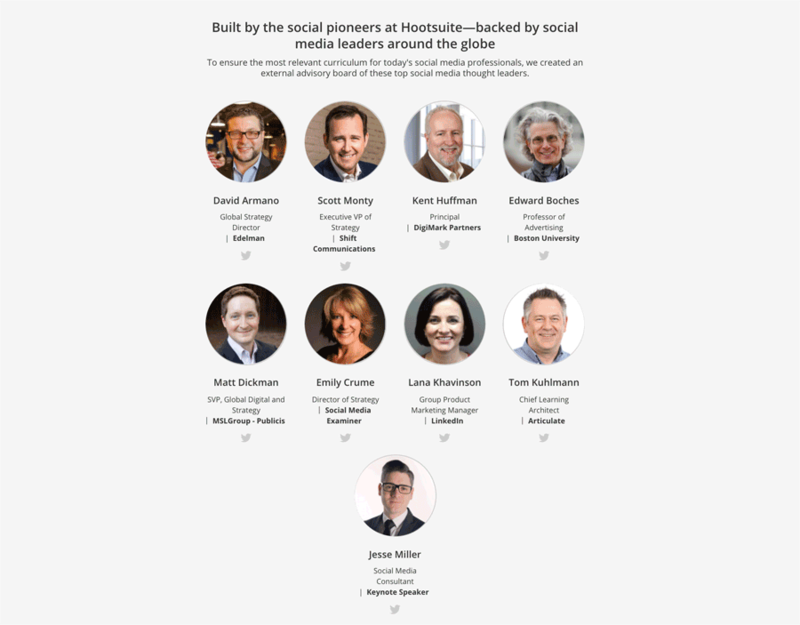 With all these accolades under its belt, it’s no wonder Hootsuite set out to create a social media academy as well. 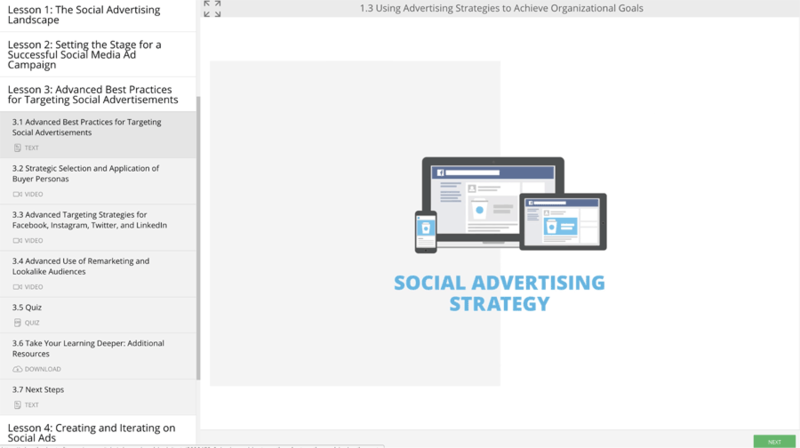 While there is no instructor for this course (the videos are animated, explainer‐like clips), Hootsuite has an advisory board review the course content (see screenshot below). This course is divided into six lessons, which are further broken down into four to nine bite‐sized videos each. In addition to the explainer‐like clips I mentioned earlier, you’ll also get access to downloadable templates, notes and quizzes. Robert Rose is the chief strategy adviser for the Content Marketing Institute (CMI) with more than 15 years of experience in helping brands develop content marketing strategies. He also co‐authored “Managing Content Marketing” with CMI Founder Joe Pulizzi (who recently announced he’ll be leaving to focus on other projects) as well as the “The 7th Era of Marketing,” with Carla Johnson, another Content Marketing University instructor. 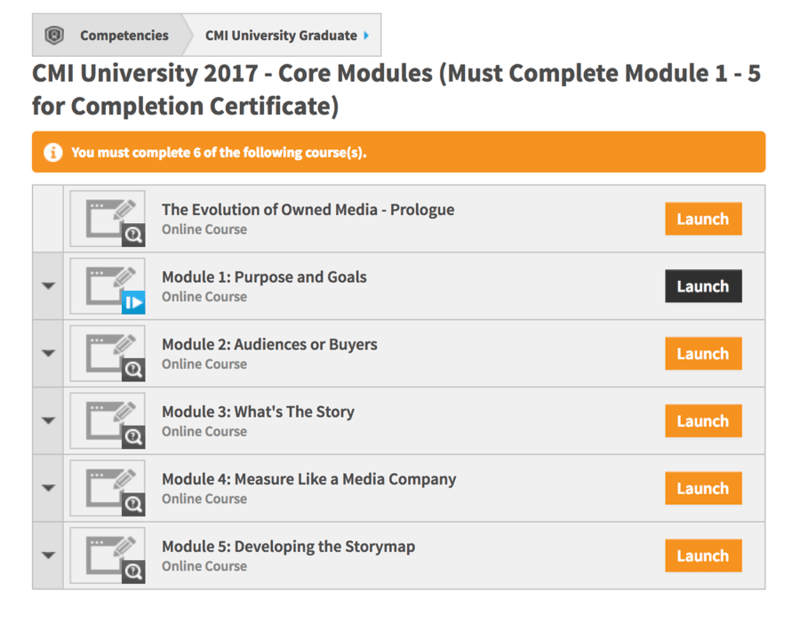 Rose teaches the five modules (see screenshot below) students must complete to graduate from Content Marketing University. Each module is broken up into a few ~1‐hour video lessons accompanied with follow‐along transcripts, and slides as well as exercises and quizzes. There is a lot of bonus content or “electives” you can take from other instructors, who work at prominent companies, like Orbit Media, NewsCred and Uberflip. While Content Marketing University is currently closed, enrollment, which costs between $595 and $995 per learner, reopens March 1. 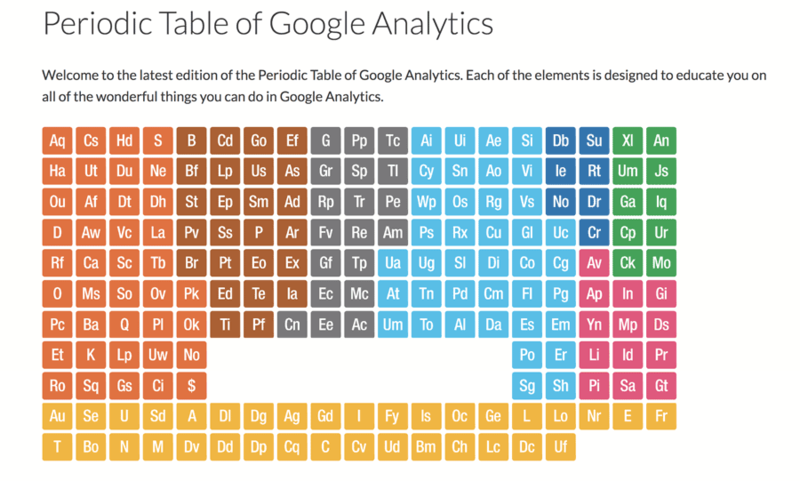 You might recognize his Periodic Table of Google Analytics from Jeff Sauer. Jeff has been in Internet marketing since 2005. He founded Three Deep Marketing, which he’s grown by 500 percent to $6 million in revenue, buying him a spot on the Inc 5000 list from 2010 to 2013. Jeff is also the creator of the Google Analytics Training Course that’s been featured on AppSumo and highly recommended by Rand Fishkin, Cyrus Shepard and Mike Sullivan. 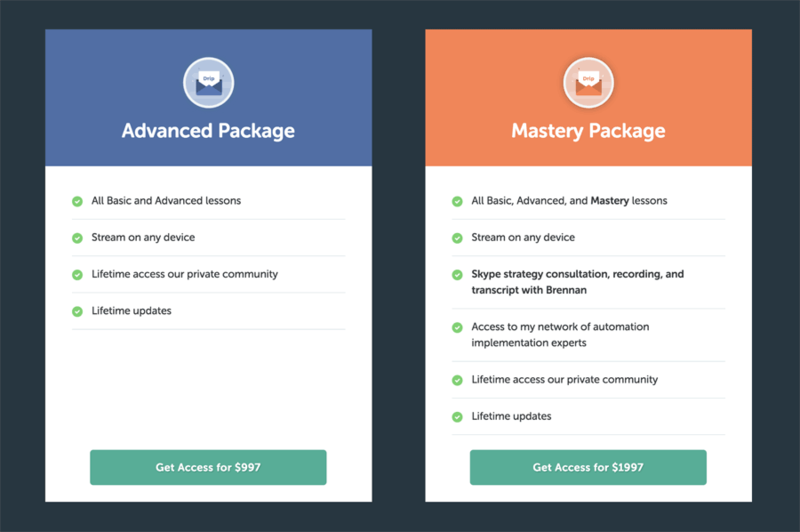 The course costs between $497 and $1,997 (although I scooped an AppSumo deal for $39). For that price, you’ll get access to an exclusive Google Analytics forum, your Google Analytics certification, 33 on‐demand videos and more. 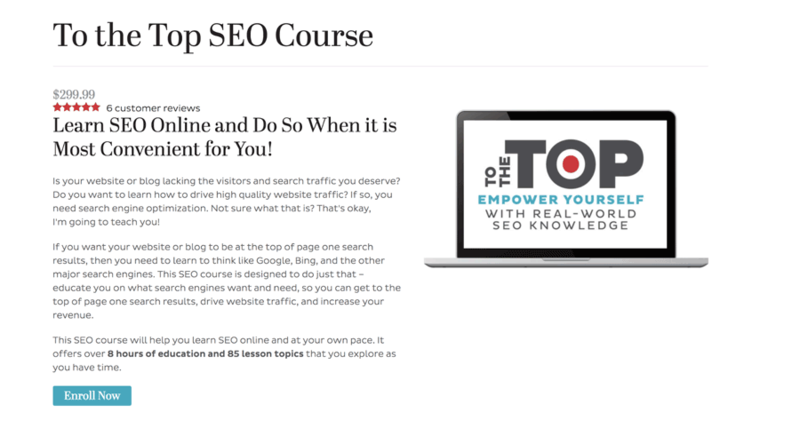 While Gill offers multiple courses on her site, I had the pleasure of reviewing her SEO Training Course, which goes for $299. 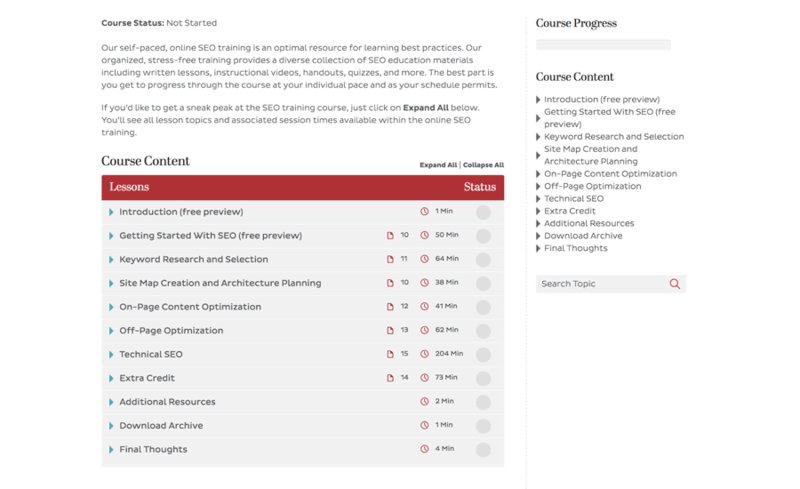 In the screenshot below, you can get a glimpse into the course’s structure and content. Each lesson is broken down into smaller lessons, which are mostly text‐based but do include some videos. Gill recommends completing the course in order although it is self‐paced so feel free to skip around as needed. In addition to the course content, you also get access to templates, tool suggestions and quizzes to test your knowledge. This is a Digital Marketing course from Ahrefs. Although it is free, I could not but add it to the list. This online course is mostly focused on marketing newcomers, but even the SEO veterans can find a few elegant tricks in it. Every lesson includes solid examples to back up every advice it gives. Everything you will learn can be easily extended outside Ahrefs. This very much applies to online courses. Keep that in mind when you go to purchase your next online marketing course. Now, go forth young grasshopper, and may the force be with you.